The University of York, in the summer of 1978 – 18 June. 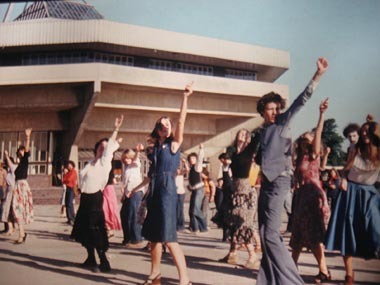 Students show off their ‘Saturday Night Fever’ style dance moves in the ‘Summer Spectacular’, their raised arms mirroring the lines of the Central Hall behind them. The university is celebrating its 50th anniversary this year. This fantastic film follows the building of the university campus. It begins with an introduction to the city of York then follows the building work at Heslington. Makes you appreciate this great achievement, and conveys the excitement of the building project and the opening of this new university for York. 3.05 Interior of St John’s church, Micklegate, occupied by the Institute of Architectural Studies. More familiar to many of us as the Arts Centre, in later years. 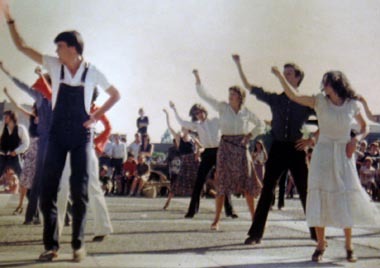 Another photo from the 1978 Summer Spectacular, featuring more dancing, and a man in dungarees. Younger readers perhaps won’t have seen dungarees before, but they were quite the thing around this time. No, no one knows why. Thanks to Andy Tuckwell for these photos. More of Andy’s photos of the event are viewable in this online album. I hope to get over to the university when the weather warms and brightens, to get some long-overdue photos of both the 1960s buildings and more recent additions. For now, you may be interested in the excellent website they’ve put together to celebrate their first 50 years. And if the film or the photos have prompted memories, the university would like to hear from you. See this page for more details.